October 31, 2018 – A day after Typhoon Rosita made landfall in the province of Isabela, the Municipal Action Team (MAT) of Echague has started doing response operations to affected individuals and families in the municipality. The MAT is also lending a hand to the Local Government Unit (LGU) of Echague and other frontline agencies in doing initial rescue and clearing operations in the municipality. Mr. Paolo L. Laggui, Project Development Officer II of the Sustainable Livelihood Program (SLP) and MAT member of the municipality, said that coordination with the LGU ensures the prompt delivery of services to families and individuals affected by the typhoon. “Patuloy ang pakikipag-ugnayan ng Municipal Action Team sa Lokal na Pamahalaan ng Echague upang maghatid ng serbisyo sa mga apektadong pamilya dulot ng Bagyong Rosita,” Mr. Laggui added. Aside from this, the MAT team also augments the basic needs of those who were evacuated by cooking food for them. Joan M. Arao, also a Project Development Officer in the area, relishes the fact that they can extend help to those in need during disaster situations. “Hindi alintana ang pagod, puyat at hirap para makapaghatid ng mapagkalingang serbisyo para sa mga nasalanta nating kababayan,” Ms. Arao added. To date, 8,365 families including 31,221 individuals were affected by the typhoon in the province. To address those affected, the field office distributed a total of 3,270 family food packs to the province of Isabela, 160 of which were given to affected families of Echague. Ilagan City, Isabela – The secretary of the Department of Social Welfare and Development (DSWD), Rolando Joselito D. Bautista, yesterday arrived in the province of Isabela to monitor the preparedness of the region in response operations for Typhoon Rosita. Secretary Bautista visited the Social Welfare and Development (SWAD) Isabela to check on the status of monitoring of affected individuals and families throughout the province. DSWD Field Office 02 Regional Director Leonardo C. Reynoso, meanwhile took the opportunity to brief the secretary on the status of response operations in the region while assuring the readiness of regional staff to do response measures for the storm. 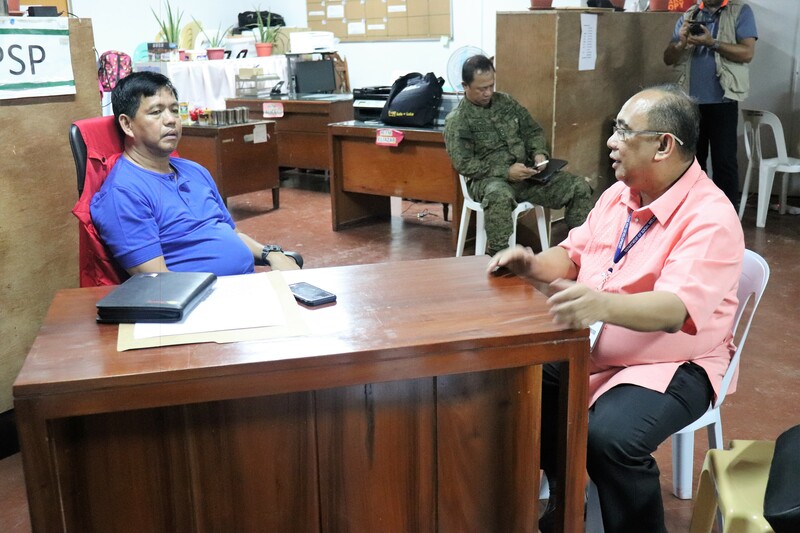 As part of the visit, a meeting between the secretary and Isabela Governor Bojie G. Dy was held to discuss augmentation procedures that the agency can do to help the province before, during and after the storm. The secretary will continue to closely monitor the storm and conduct initial validation of damages in Isabela with the assistance of Mr. Franco G. Lopez, Head of the field office’s Disaster Response and Management Division (DRMD), today. As of 12 midnight of October 30, 2018, a total of 964 families including 3,381 individuals are in 59 evacuation centers throughout Isabela. A total of 3,270 family food packs were given by the field office to municipalities in the province who are in the direct path of the storm prior to its landfall. Tuguegarao City – More than a month after Typhoon Ompong made landfall over Cagayan province, the field office has fulfilled its mandate for the prompt distribution of assistance to families affected by the typhoon. To date, a total of 81,566 family food packs where distributed to affected cities/municipalities across the region with a total cost of assistance for food and non-food items totaling P39,311,011.00. Local Government Units (LGUs) who were given family food packs where then mandated to immediately distribute the assistance to affected constituents for quick provision of aid. The field office, though lacking in manpower, was able to swiftly retrieve reports of affected families and individuals coming from LGUs which were then used as basis for the provision of relief items to those affected. Aside from relief goods, the agency shall also provide Emergency Shelter Assistance (ESA) to families/individuals whose houses were partially/totally-damaged by the typhoon. According to DSWD Memorandum Circular No. 19 Series of 2018 “Guidelines in the Implementation of the Emergency Shelter Assistance for the Typhoon “Ompong”-affected Households with Damaged Houses,” under Part VIII. Implementation Mechanisms, specifically under Social Preparation of LGUs, Sub Item 1.1.3., the LGU identifies ESA beneficiaries and certifies their duly accomplished application form. October 29, 2018 – The Department of Social Welfare and Development Field Office 02 (DSWD FO2) is on full alert for the looming landfall of Typhoon Rosita this week. Members of the field office’s Disaster Response and Management Division (DRMD) attended the Pre-Disaster Risk Assessment (PDRA) attended by members of the Cagayan Valley Regional Disaster Risk Reduction and Management Council (CV-RDRRMC) led by the Office of Civil Defense (OCD) Region 02 last October 26, 2018. As part of the agreements during the said meeting, the OCD committed to providing additional logistics for the prompt delivery of relief goods to communities throughout the region. The field office’s Disaster Management and Response Team (DRMT) will also be rendering 24/7 duty starting 7 pm today. An Emergency Operation Center will also be set up in the field office’s lobby section to complement staff in disaster duty. In line with the 26th year of celebrating the National Family Week, the Department of Social Welfare and Development Field Office 02 (DSWD FO2) conducted indicative activities to commemorate the celebration which ran from September 23 to 29 of this year. 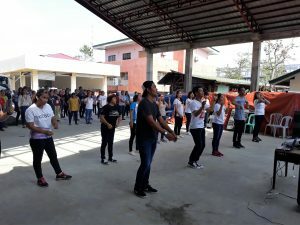 The first activity was done on September 28, 2018 with the conduct of a zumba for DSWD FO2 staff in line with the theme for this year’s celebration, “Tungo sa Maginhawa, Matatag at Panatag na Pamilyang Pilipino” which envisions a strengthened Filipino family for the new generation. The said activity aims to encourage field office staff to take a short break and to start moving for a healthier lifestyle while also developing cooperation, camaraderie and harmonious relationship among them. The activity also aims to impart to participants the importance of having a corporate family while also highlighting the importance of spending quality time with their loved ones in their homes. On the same day, a radio program at DSWD Dos On Air! 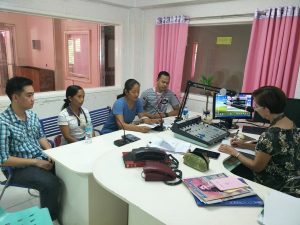 at DWPE Radyo ng Bayan was also done with the able assistance of Mr. Ed Arman Ventolero, Attorney IV and head of the field office’s Legal Service. Republic Act No. 8972 otherwise known as the Solo Parent Welfare Act of 2000 was discussed for information on the different rights afforded to solo parents. Ms. Ligaya Francisco, a Pantawid Pamilyang Pilipino Program beneficiary from Allacapan, Cagayan whose family was adjudged winner of the 2018 Regional Search for Huwarang Pantawid Pamilya, also attended the program where she shared her experiences and strategies in keeping afloat her family despite the daily struggles that she faces while being part of an underprivileged family. The celebration was also simultaneously done in the field office’s centers and institutions were clients and residents were given the chance to be reunited to their love ones, spend quality time and strengthen their bond for a positive family life. Part of the games done to commemorate the celebration incorporated meaningful family values such as unity, care and protection. Center staff were also given commendation for their efforts in adhering to their functions in the centers with a focus on managing clients. October 12, 2018 – About a month after Typhoon Ompong made landfall in the region, citizens of Dupax Del Norte in Nueva Vizcaya province recall how fortunate they were that they followed preparations made by field office staff and their local government unit (LGU) that minimized the extent of damage to their lives and livelihood. Ms. Sheila Mie Naboa, one of those who were evacuated from Barangay Lamo, said that they were provided with all their necessities from the time they arrived in the evacuation center up until they were allowed to go home. “Bilang evacuee, hindi nagkulang ang DSWD sa pagbibigay ng aming mga kailangan dahil pagkalipat [pa lamang] namin sa evacuation center ng Biyernes [September 15] ng mga alas dos ng hapon ay may pagkain na [kaming] pwedeng iluto. [Bago kami umuwi ay may binigay pang] relief goods para may makain kami dahil hindi kami nakapagtrabaho ng dalawang araw dahil sa bagyo,” Ms. Naboa recalled. A total of 178 families including 554 individuals were pre-emptively evacuated before the landfall of the storm on September 15 to seven (7) evacuation centers throughout the municipality while 300 family food packs were prepositioned by the field office to the area as augmentation to the existing relief goods of the municipality. Dimple Mauricio, the Municipal Link for the Pantawid Pamilyang Pilipino Program and team leader of the field office’s Municipal Action Team (MAT) in the area, said that the team joined staff from the LGU in going to different areas within the municipality to identify families at risk. The team had to convince families to evacuate and though some initially hesitated from leaving their houses, they eventually relented given the premise of a safer place where they can stay during the storm. “Puspusan ang ginawang paghahanap ng LGU at ng barangay kasama na tayo upang hindi na maranasan ang sinapit natin sa mga nakaraang bagyo. Nagsagawa tayo ng evacuation para sa kaligtasan ng mga tao lalo na sa mga lugar na laging nababaha,” Ms. Mauricio added. Baggao, Cagayan – The absence of electricity and the intense heat of the sun didn’t stop the Municipal Action Team (MAT) who yesterday joined the Municipal Disaster Risk Reduction and Management Office (MDRRMO) in conducting assessment of damaged houses caused by Typhoon Ompong in this town. The four-member MAT joined a team that also included staff coming from the Department of Health (DOH) and the Philippine National Police (PNP). The team was split into 4 teams that set up command posts in barangays’ Poblacion, Bagunut, Tallang and San Jose for efficiency in the assessment of houses. Mr. Christian C. Nicolas, the MAT team leader and Municipal Link for the Pantawid Pamilyang Pilipino Program of the municipality, said that cooperation between members of the MAT made the assessment of houses easier to accomplish. “Nagtutulungan kami bilang isang grupo (MAT) para mabigyan ng serbisyo ang mga higit na nangangailangan,” Mr. Nicolas added. Baggao, Cagayan was the hardest-hit area by the aforementioned typhoon, making landfall in the municipality at 1:40 AM of September 15, 2018 and leaving a trail of 1,964 totally damaged houses and 12,091 partially-damaged houses according to initial reports coming from the local government unit. This figure is being assessed for veracity by the assessment team. The field office was able to preposition a total of 300 family food packs before the landfall of Typhoon Ompong while augmenting an additional 3,300 food packs after the storm. Tuguegarao City – The Samahang Magbubukid sa Lambak ng Cagayan, Inc. in partnership with the National Irrigation Administration (NIA) Region 02 donated a total of P329,110.00 to the Department of Social Welfare and Development Field Office 02 (DSWD FO2) last September 24, 2018 as additional help for Typhoon Ompong-affected families in the region. The group was led by Ms. Rubelita S. Bancod, the Division Manager of NIA’s Administrative and Finance Division, who mentioned how glad they are that their group can make a difference with the donation they made. “We want to be involved with relief operations and this (donation) is one way that we will be able to help,” Ms. Bancod mentioned. OIC-Regional Director Lucia S. Alan personally welcomed the group along with OIC-Assistant Regional Director for Administration, Mr. Celso Arao, Jr.
OIC-Alan said that the amount will be used immediately and instructed the Disaster Response and Management Division (DRMD) to process the needed documents to use the amount for response measures.